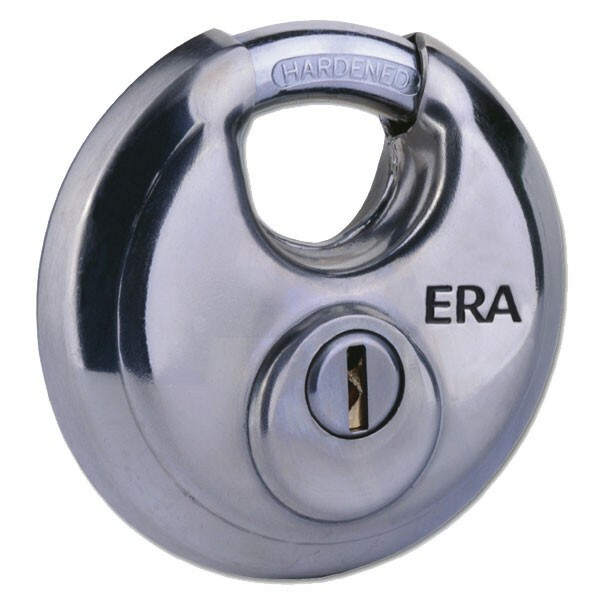 This high security discus padlock from Era features a stainless steel lock body, a hardened steel shackle (to protect against bolt cutter attack) and a 4-pin brass cylinder with bump, pick and drill resistant properties. This padlock is well suited to high risk security areas and applications such as factories, gates and storage units. Features: Hardened steel shackle protects against saw and bolt-cutter attack. Suitable for a range of applications such as factories, gates, outdoor/indoor storage and toolboxes. Stainless steel lock body. Bump, pick and drill resistant 4 pin brass cylinder. Lever locking mechanism.